New South Wales (NSW) is located on the east coast of Australia and has a coastline approximately 1000km long (see map). The prevailing East Australian Current which runs from Queensland in the north to Victoria in the south mixes warm tropical waters with cooler temperate waters. The continental shelf adjacent to NSW is narrow compared to other states in Australia and indeed other countries. These environmental conditions provide for the existence of a range of commercial fisheries that are small by volume compared to many European fisheries, but extremely diverse in terms of the number of species taken (over 130) and the gear types used (Goulstone 2000). The current fishing regime in NSW involves about 30 different types of commercial fishing licences or endorsements overall, each of which authorises a different type of fishing within eight defined marine commercial fisheries (see Table 1). There are approximately 1700 licensed commercial fishers overall. Most fishing operations are single fisher or family enterprises with little corporate involvement. Although NSW has had a requirement to licence commercial fishers and fishing boats since the introduction of The Fisheries Act 1881 it was only relatively recently, in the 1980s, that fishing licences were first restricted. 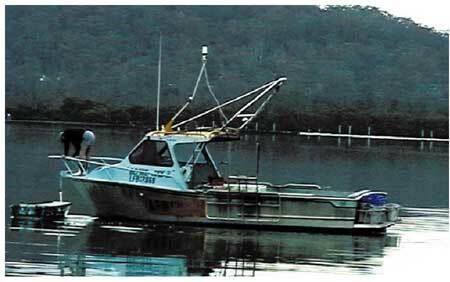 Fishing boat licences were first limited in 1984, whereas fisher licences were not limited until 1987. The nature of the limitation was general, allowing licence holders to undertake most activities. Limited access has been introduced for some individual fisheries over the years, however only as of 1997 were restrictions by method, species and area implemented in the main commercial fisheries through the introduction of a specific restricted fishery management regime (see Table 2). Some significant milestones with respect to the allocation of harvesting rights in NSW were the commencement of the Licensing Policy in 1994 and the introduction of The Fisheries Management Act 1994. The Licensing Policy inaugurated the process of catch validation, which involved identifying the records of historical catch for each fishing business between the years 1986 to 1993. The policy included a requirement for new entrants to the industry to acquire a fishing business with a minimum level of validated catch history before a new licence could be issued. It has provided a way of consolidating unused, or little used, fishing licences over time, and ensures that real fishing effort is being reduced upon licence transfer. The validated catch history of a `fishing business' is quantified prior to the transfer of the business, and the market value of the business normally varies depending on the amount of validated catch history associated with it. The validated catch history was later used to allocate endorsements in the new restricted fisheries, which is the subject of this case study. The introduction of the Fisheries Management Act 1994 provided two broad frameworks for managing commercial fisheries; share management fisheries and restricted fisheries2 . The share management fishery scheme enables the issue of shares with a statutory right to compensation if the shares are cancelled. The restricted fishery regime provides an alternate limited access management framework which does not have the same right to compensation. A detailed comparative review of the share management fishery and restricted fishery regimes has been described by Goulstone (2000) and is not repeated here. In this account we follow the allocation process with the Ocean Trap and Line Restricted Fishery. The fishery uses square wire mesh fish traps3 , a variety of line methods including handline, dropline, bottom set longline, trolling, and lift nets targeting spanner crabs. Normally one or two persons conduct daily trips to sea on boats of around 6-8 metres (20-26 feet) in length. The fishery operates along the entire length of the NSW coast. The introduction of the Fisheries Management Act 1994 brought about significant changes to commercial fishing rights and entitlements in NSW. Prior to the introduction of this Act, fishing licences were renewed annually and were subject to cancellation if a fisher failed to spend the major portion of their time, or earn the major portion of their income, from fishing. This provided little security for the industry as fishers were sometimes required to prove their financial details, and licences could potentially be cancelled at each annual renewal. The requirement forced fishers to work harder than they may have wanted or apply more fishing pressure on the resource than was desirable (Goulstone 2000). This regime was replaced by an automatic licence renewal process. Irrespective of the new share management provisions, this change to the licensing regime was a significant enhancement to the rights and security of the industry. No longer are fishers subjected to annual licence renewal assessments and the Government now has limited grounds upon which to refuse a renewal application, when they do so it is primarily related to breaches of the Act. The relatively open licensing-regime that was in effect prior to the introduction of restricted fisheries in 1997 failed because there were no controls on the movement of fishers, boats or effort between fisheries. For instance, if the majority of licence holders decided to begin fishing in the ocean trap and line fishery there was no easy way of preventing it. It was necessary to clearly define each fishery and limit the number of participants to ensure the long-term sustainability of the resource. The decision to establish a restricted fishery for ocean trap and line and the other major commercial fisheries was made in August 1995. The fishery commenced some 18 months later, on 1 March 1997. The fishery was divided into different component parts. The harvesting right granted through the allocation process could have up to six specific endorsements4 . The endorsements authorise the use of gear and the taking of species in the various parts of the fishery. Fishing businesses became eligible for the entitlements based on their validated catch history. The fishing business is transferable as an entire package with all associated validated catch history. A new entrant is eligible for a fishing licence if the combined validated catch history of the business meets the minimum level (called a "recognised fishing operation" or "RFO"), and then qualifies for endorsements in each fishery based on whether the individual eligibility criteria for each endorsement are satisfied. There is cap on the total number of fishing businesses, with new entrants having to buy existing businesses with validated catch history to operate in the fishery. All licences and endorsements associated with a fishing business must be transferred together and cannot be split. The endorsements on the licence are valid for the period specified in the endorsement, which is currently the same annual period as the licence. Licences or endorsements can be suspended, cancelled, or refused renewal by the Minister for breaches of the Fisheries Management Act 1994 and in other circumstances such as the failure to pay the relevant fees or contributions. Fishing businesses can be held in company or partnership names but licences and endorsements can only be issued to natural persons. Consequently, there are provisions which allow fishing business owners to nominate a person to hold the endorsements of the business, though the nomination must involve all endorsements of the business. Although not legally recognised, the nomination provision makes leasing possible under certain circumstances. Since the allocation of endorsements in specific fisheries, the market value of businesses has changed depending on the endorsements held and the amount of validated catch history associated with the fishing business. The policy objectives of the allocation process were to include and legitimise past fishing activity and establish a base for future management through relating fishers' past participation to designated fisheries. The aim was not to radically restructure fishing capacity, but to limit the number of different designated fisheries accessible to a business. Once the participants in the fishery were defined, it was considered more effective and efficient to consult with those fishers on the development of a fishery management plan. It has been difficult historically to resolve management issues in the fishery without having a defined group of fishers who had a substantial interest in the fishery to consult with. As will become apparent, the first set of criteria proposed for the ocean trap-and-line fishery was criticised as being too high, potentially excluding many of the smaller or diversified businesses. The first step in the process was to seek nominations from the commercial fishing industry and the recreational fishing sector for positions on the Ocean Trap and Line Steering Committee. The Steering Committee was required inter alia to clearly define the fishery (including the endorsement types that would apply) and make recommendations to the Minister on the eligibility criteria required for ongoing access to the fishery. Membership of the Committee comprised four industry representatives, two recreational fishing representatives, NSW Fisheries Managers and observers from the areas of fisheries research and compliance. A set of proposed eligibility criteria, based on a minimum tonnage, or value of validated catch history, were developed at the first meeting of the Steering Committee and mailed to all licence holders in December 1995. The criteria were also published in the bimonthly industry magazine. Fishers were asked to provide written comments on the proposals in time for a second meeting of the Steering Committee in February 1996. Fishery managers held meetings at various ports during this period to personally discuss the draft criteria with fishers. "The Evans Head Fishermen's Co-operative could close down if proposed entry criteria for the trap & line fishery are introduced." "But with NSW Fisheries proposing that a fisherman should have a history of big catches to gain entry to a particular fishery, the fisherman with a lower level of catch across a number of fisheries will be knocked out." "The Fisheries Department has got to be flexible enough to look again at this properly and work through the problem with fishermen, and give a fair go to fishermen with a genuine commitment to the fishery". Out of the 440 written submissions submitted on the draft criteria for all proposed restricted fisheries5 , 49% were from fishers concerned with the performance level of the ocean trap-and-line criteria. The draft criteria were revised at the second (and last) meeting of the Steering Committee. The criteria were softened to take into account the legitimate contention that diversified fishers would have suffered had they remained as originally proposed. Of particular significance was the change from a weight or value of catch history to one based on the number of monthly catch returns that showed relevant activity. In other words, it was not the quantity of catch that counted at that stage but the fact that the fishing activity had been historically undertaken. The revised criteria were once again mailed to all licence holders for comment and published in the industry magazine. The distribution was wider this time with the criteria published in the NSW Government Gazette and a statewide prominent newspaper seeking public comment. Surprisingly few submissions were received from members of the public and the changes seemed to have addressed most of industry's concerns. Small variations were made to the draft criteria following the round of public consultations and the criteria were subsequently approved by the Minister. An invitation to apply for endorsements in the new Ocean Trap and Line Restricted Fishery was sent to each fisher in September 1996, some 10 months after the first steering committee meeting. Applications closed on 31 December 1996. The allocation process defined ongoing access to the ocean trap-and-line fishery in the form of endorsements on the licence. The diversity in fishing methods within the fishery led to six different endorsement types being created, each one authorising a different form of trap-and-line fishing. The criteria for the allocation of endorsements was based predominantly of the level of validated catch history of the business. Table 3 provides a description of the endorsement types and the approved eligibility criteria. The eligibility criteria for the Ocean Trap and Line fishery, and indeed most other restricted fisheries, relied heavily on the historic catch data submitted by licensed fishers over the years. Fishers have been legally required to submit monthly catch returns to the Government for over 50 years, declaring generally where and how they fished, and the quantity of each species landed. The catch validation process which commenced in 1994 took into account records of catch between the years 1986 to 1993. Whilst available, the accuracy of the records prior to 1986 was questionable and they were avoided. The catch return forms were changed in July 1990 to improve the level of reporting. Whereas the old catch returns only required fishers to indicate the main method used during each month, the new form required fishers to list every method that had been used. Because the eligibility criteria were based largely on the number of catch returns indicating that a method had been used, the old returns posed some difficulties in the allocation process. Fishers claimed that particular methods have been used, but that it was not their primary activity. This was a situation well known by the fishery managers and the Steering Committee members when the criteria were being developed, and there was general agreement that applicants who could not satisfy the criteria on the basis of the catch return information would need to lodge an appeal and provide evidence of their activities. However, to facilitate the assessment process and avoid the need for genuine fishers to have to appeal, a species matrix was developed and used on a case-by-case basis to determine whether a gear type had been used. For example, where commonly trapped species such as snapper, morwong and leatherjacket appeared together on a catch return, it would normally be accepted as a `fish trapping' return. * An interim restriction was implemented for spanner crabs in 1995 in response to concerns of overfishing, and administered through a permit scheme. For the endorsement types where a quantity of product was required (such as the spanner crab endorsements, school and gummy shark endorsement), fishers were able to provide audited marketing records to prove that they had landed a greater amount of product than that indicated on their catch returns. However, these additional records were not accepted unless signed by a registered company auditor. Catch return data or market data that were known, or suspected, to be wrong were not counted towards the eligibility assessment for a businesses. The identification of validated catch history and assessment of each fishing business against the approved criteria was a time-consuming and complex process, but was seen to be an equitable way of defining ongoing harvesting rights. Fishers who were unsuccessful in their applications for endorsements were provided with the opportunity to appeal to an independent review panel. The composition of the panel, the grounds for appeal and the process to be followed were established in legislation. The appeal process provided an inexpensive alternative for fishers to the normal Court process. a person with extensive practical experience in the commercial fishing industry (but not a person who had a financial interest in the fishery to which the appeal relates); the appointed person was a well respected retired NSW commercial fisher. The grounds for appeal were relatively broad and are included in Box 1. To prevent frivolous or spurious appeals, fishers were only allowed to appeal for endorsements that they applied for and were subsequently refused. The closing date for appeals was set at 31 December 1997, some 10 months after the commencement of the restricted fishery, to give fishers ample opportunity to assemble their supporting information. (iii) the person was engaged in fishing during that period and for other significant reasons (that are not attributable to the fault of the person) the person was unable to satisfy the eligibility criteria. The review panel did not have the power to grant an endorsement to a fisher, but could make recommendations to the Minister on whether or not an appellant should receive an endorsement. The Minister was unable to decide against the decision of the review panel by law, but could refer the matter back to the panel (together with comments or recommendations) for further consideration. This model proved successful at preventing the Minister from being heavily lobbied by appellants following the recommendation by the review panel. Within the applications submitted, the grounds for appeal varied considerable. Table 4 indicates the number of appeals lodged for each endorsement type and the success rate of the appeals. The number of withdrawn applications is relatively high, due partly to the existence of a policy that required all pending appeals for a fishing business to be withdrawn prior to a business being transferred. Once an appeal was lodged, appellants were permitted to fish in that part of the fishery until the result of their appeal was known. This was an important aspect to have included in the appeal process for both equity, fairness and political reasons, but meant that some fishers lodged appeals simply to be able to continue fishing past the restricted fishery commencement date. There is no easy solution to this problem. Stage 1 was an initial consideration by the review panel of the evidence supplied with the application for appeal. If sufficient evidence was available a recommendation was made to the Minister that the endorsement/s be granted. Stage 2 was a request by the panel for further documentary evidence to be supplied, and reconsideration of the appeal following the provision of additional information. As with Stage 1, if sufficient evidence became available a recommendation was made to the Minister that the endorsement/s be granted. Stage 3 was a face-to-face hearing, including the provision of verbal evidence from the appellant and from NSW Fisheries, with questioning and cross examination. At this stage, the panel made a final decision as to whether or not an endorsement would be recommended to the Minister. The face-to-face hearings conducted by the review panel at stage 3 were normally held in meeting rooms at District Courts. To reduce the need for fishers to travel, the review panel conducted hearings in convenient regional locations. The allocation process was completed by NSW Fisheries without assistance from external consultants. However, the substantially increased workload necessitated the employment of additional temporary staff and considerable periods of overtime. It is not possible to estimate the level of resources expended specifically to allocate harvesting rights in the ocean trap-and-line fishery because the assessments for five other restricted fisheries were being undertaken at the same time. When it got closer to the restricted fishery commencement date and the deadline for mailing out the results of each fisher's assessment, up to 25 staff were working on the overall project, often throughout the night and over weekends to ensure that things would be delivered on time. This required a high level of dedication, motivation and morale of the individual staff involved. Once the results had been sent to fishers6 , substantial staff resources were required to answer telephone inquiries and check the assessments for apparent errors. Relevant staff were sent on a short training course in conflict resolution to learn how best to deal with disgruntled fishers who were displeased with the results of their assessment. The Fisheries Managers and administrative staff spent a number of days in the field after the allocation results were sent to fishers to go through the assessment with unsatisfied fishers. This proved to be a valuable exercise. The appeals process also consumed substantial staff and financial resources and was a two to three year process to complete. The resources needed for appeal processes should not be underestimated! It is also not possible to calculate the level of financial resources used to allocate endorsements in the ocean trap-and-line fishery separately because all new restricted fisheries were administered under the same application and assessment process. However, the overall process used significantly more resources than initially envisaged and resources were eventually diverted from other Departmental programs to ensure that the project was completed on time. The application fee charged for each endorsement (A$30) recovered only a small proportion of the total costs incurred in completing the project. The fee for appeal (A$100 per fishery) was also small compared to the costs of providing the appeals service, and was refundable to successful appellants. The Ocean Trap and Line Fishery is now a distinct fishery with six different endorsement types. The program was successful in reducing the number of fishing businesses able to operate in the fishery, from around 1800 to 630. The number of endorsements allocated in each part of the fishery, after the appeals have been finalised, is detailed in Table 5. The identification of specific endorsement holders in the fishery has enabled a formal Management Advisory Committee to be formed, with industry representatives being elected by their respective endorsement holders. NSW Fisheries has been working with the Management Advisory Committee since 1997 to develop more robust fishery management arrangements, and is due to commence the development of a 5-year fishery management strategy later in 2001. As with the introduction of any fishery management strategy, there were mixed views about entering into a restricted fishery regime and about the level of the initial entry criteria. Not surprisingly, the full time ocean trap-and-line fishers pushed hard for the arrangements to be introduced and sought high entry criteria. A lesser number of endorsement holders means less competition and a reduced chance of effort shifts which could have led to increased pressure on trap-and-line resources. Conversely, the diversified or part-time fishers lobbied hard against the scheme and sought very low criteria so that they could remain in the fishery. There were often claims by fishers throughout the process that other applicants had provided false or misleading information, or gained endorsements that they did not deserve. There were also varying views about the appeals process with most people believing that it was fair and equitable, but some criticism that the review panel accepted false evidence and was too lenient. Three years on, fishers have adopted the new regime and discussions with industry representatives have indicated acceptance amongst the majority. While formal views about the restricted fishery program have not been readily communicated by non-commercial interest groups, there appears to be a good overall acceptance of the restricted fishery program as the first step in the process of management plan development. The fact that recreational fishing representatives were involved in the development of the eligibility criteria for endorsements ensured that any concerns from the recreational sector were dealt with early in the management process. The conservation sector were not involved in the steering committee process, but have had a representative on the Ocean Trap and Line Management Advisory Committee since 1997 and have been closely involved in management discussions to date. the inclusion of validated catch history in the eligibility criteria meant that fishers who had a record of participation received ongoing entitlements, whereas access was denied to fishers with no recorded history; this was seen as an equitable way of allocating access arrangements. If anything about the process could be changed it would probably be a simplification of the eligibility criteria. One of the reasons for needing such a high level of resources to implement the scheme was the complexity of the criteria and the subsequent difficulties encountered in the assessments. Additionally, a higher application fee would have been beneficial to cover the full costs of implementation and avoid drawing resources away from other areas within the Department. Since the restricted fishery commenced in 1997, NSW Fisheries has been working with the Ocean Trap and Line Management Advisory Committee to develop new transfer criteria. The criteria are aimed at ensuring that fishing businesses with ocean trap-and-line endorsements and small catch histories cannot be transferred to new entrants who may increase effort levels in (parts of) the fishery. After a further period of consultation with endorsement holders, a substantially higher level of catch history has been agreed, to apply upon the transfer of fishing businesses. The new criteria will have the effect of reducing the overall number of available endorsements over time, by consolidating small or part-time trap-and-line fishery operations. An important feature of this regime is that the small or diversified fishers have been catered for in the initial allocation process, but will not cause effort blowouts (i.e. large, rapid and unexpected increases in effort) when they exit the fishery. The fishery restructure is also funded by people wishing to enter the fishery, rather than by existing participants or Government. There has been a further development of the rights-based management structure for the ocean trap-and-line fishery more recently. The Fisheries Management Act was amended in December 2000 to roll the fishery into a new share-management fishery framework. The new framework provides a fishing right that sits somewhere in between the traditional share-management fishery model discussed earlier in this paper and the restricted fishery scheme. The new share-management scheme will involve the issue of shares in the fishery for a term of 15 years (rather than in perpetuity), which are subject to statutory compensation if they are cancelled. The model has been designed to give fishers more secure harvesting rights than those conferred by the restricted fishery regime, but with lower fees and contributions payable than under the full share-management system. The Ocean Trap and Line Management Advisory Committee will soon have the task of recommending the basis on which shares should be issued in the new share-management fishery. The options include using the validated catch history of fishing businesses, or issuing shares on the basis of the endorsements previously issued in the restricted fishery (or a combination of the two). It will be interesting to see how the harvesting rights will change, if at all, as the fishery moves through this next era. Anon. 1996. Draft Fishery Criteria: Trap & line rules could shut down Evans Head Co-op. The New South Wales Fisherman. January-February 1996. pp40-41. Goulstone, A.R 2000. Rights-based Fisheries Management in New South Wales, Australia. In: Shotton, R. (ed.) Use of property rights in fisheries management. Proceedings of the FishRights99 Conference. Fremantle, Western Australia, 11-19 November 1999, Workshop presentations. FAO Fisheries Technical Paper. No.404/2. Rome, FAO. 2000. p78-83. Fletcher, W. and T. McVea. (eds) 2000. NSW Fisheries 1998/99 Status of Fisheries Resources. NSW Fisheries Research Institute. 219 pp. Tanner, M. and G.W. Liggins 2000. New South Wales Commercial Fisheries Statistics 1998/99. NSW Fisheries, Cronulla Fisheries Centre. 21 pp. 1 The paper should not be taken as representing the views or policy of NSW Fisheries or Dominion Consulting Pty Ltd.
2 The Act has since been amended to include a third management framework called Category 2 share management fisheries, which is discussed in Section 8. 3 The traps have maximum dimensions of 2x2x2 metres (or 6.5x6.5x6.5 feet). 4 Endorsements are placed on the commercial fishing licence of a person, and both are required to take fish for sale in NSW. 5 Draft criteria were distributed at the same time for the ocean prawn trawl, ocean fish trawl, ocean hauling (purse seine sector), estuary prawn trawl and estuary general fisheries. 6 All fishers were notified of the results of their applications for access to all restricted fisheries at the same time.